Regular readers of this blog might like to skip this post because there will be nothing new in it. The reason? When I decided to come to Pangani and Denis first suggested the YMCA as somewhere to stay, I must admit I didn’t immediately leap up and say, “Yes. Just what I want.” I decided to do what tends to be ‘the norm’ these days and I went on the Internet, opened Google, and typed in Pangani YMCA. The information that I then received was, to say the least, mixed and very much out of date, so this is my opportunity to put the record straight so that any future travelers at least have a shortened version of my experiences. There are some small negatives but I will summarise those at the end. How to get here. The only real way by public transport is to get a bus to Tanga, or if coming from Dar es Salaam get the 8:00am Shillingi VIP bus from Dar straight through to Pangani. At the time of writing the prices are Dar to Tanga – Tsh 12 000, Dar to Pangani – TSh 14 000. Once in Tanga you have a choice of getting a Daladala (minibus) or the occasional big bus to travel the unmetaled road to Pangani. The price for this is Tsh 2 000. You need to tell the conductor you want Mkoma Bay and he should then drop you at the end of a track that splits with the right going to the YMCA and left going to Mkoma Bay tented lodge. The YMCA is about 300m down this track. If you are lucky enough to have your own transport the centre is about 5km from Pangani on the Tanga road. 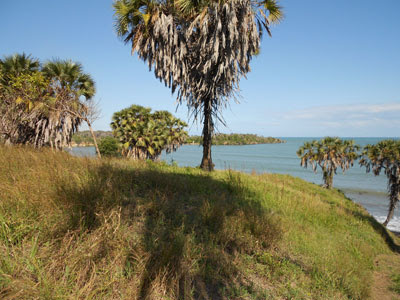 Coming from Pangani you will pass a road junction on your left with a raised barrier used by the police, and about 2km later there are signs on both sides of the road advertising YMCA and Mkoma Bay. Turn right into the track. If approaching from Tanga you will pass a village called Choba where an international school is clearly advertised. About 1km later look for the signs. If you get to the road barrier and road junction just mentioned, you have overshot. 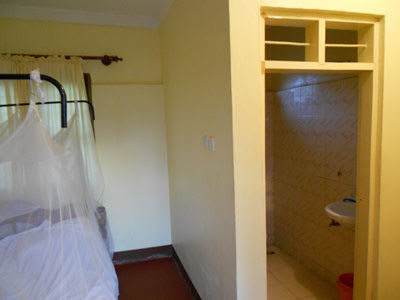 December 2012 the price for bed and breakfast per night is Tsh 20 000 for one person or Tsh 30 000 for a couple sharing a room. (Tsh 20 000 is about £8, 10€ or $13 ) The cost includes temporary membership of the Tanzanian YMCA and no, you don’t need to be young, male or a Christian. During my second week here a Muslim young lady spent a night in the room next to mine. Dinner will cost an extra Tsh 7000. 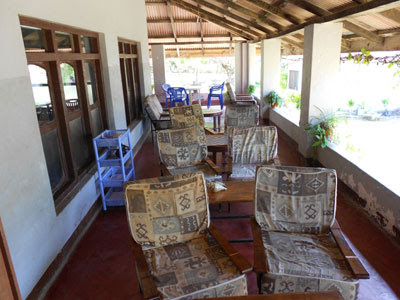 The price compares with the rates next door at the tourist camp of Tsh 120 000 per night (incl evening meal). Before I go further, is it worth the trouble? Well, I have just finished 11 weeks of a 13 week stay here and it has been idyllic. 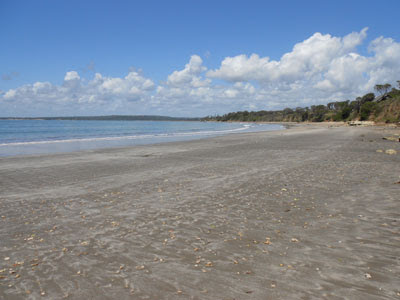 The centre has its own path leading down to Mkoma Bay beach and most times when you go down there you find acres of sand without another single occupant. The sea is easily accessible and the slope of the shore means that the swimmer can quickly get to swimming depth whilst the non-swimmer should have no worries about getting out of their depth. The views from the front of the centre are beautiful and have certainly been a restful way of unwinding after a day’s teaching. The first thing you see on entering the site is the large community hall on the left. This has just been completed and is, as it says, for community use and weddings etc. The main building and office are straight ahead but are usually approached from the seaward side through the veranda lounge where some of the locals gather in the late afternoon/evening for a beer, coke, etc all well priced. The centre has five rooms, all capable of accommodating two people; two circular Bandas and a new rectangular block of three rooms. The rooms are clean and basic. When the local water supply doesn’t let you down, every room has a wet-room with toilet, wash basin and shower and the new block has working ceiling fans. Bed linen and towels are changed every two days and the general standard of cleanliness is excellent. Breakfast is basically eggs, in whatever form you like them, bread or toast, coffee or tea, and a piece of fruit. The evening meal, which you have to order, can be beef, fish or chicken with chips or rice and salad or cabbage. No menu, you say what you want and if they’ve got it, they’ll cook it. Certainly, if you are a fish fan, you are in for a treat as the fisherman usually comes up the path from the beach, meets one of the staff, who select what they want, weigh it and pay for it there and then. The centre offer a washing and ironing service with socks starting at Tsh 400 up to a pair of trousers at Tsh 1000. No Comfort or Lenor I’m afraid but spotless and well pressed. Is it popular? At the moment surprisingly not. Apart from weekends, during my 80 days here I have been the only occupant for much of that time. This does not mean that word won’t spread, as a group of four backpackers this weekend were toying with the idea of scrapping there pre-paid bus tickets out of Tanga to extend their stay here. Although not providing any ‘touristy’ things itself, some residents have paid and joined boat trips and snorkeling trips with the Tented Lodge next door. I haven’t tried this myself yet, though I have been round a couple of times for a meal by way of a change (Tsh 25 000). Internet. Very important to me, so I will mention it. From my experience the best modem dongle is Vodacom although I understand that Tiga are extending their 3G network sometime in the near future. Airtel also works, but at the YMCA the best signal was Vodacom. Make sure you buy an Internet bundle though as indiscriminate use can turn out expensive. I promised you the negatives. Here goes. If you have no transport Pangani is a bit of a dead end with the road to and from Tanga as its only link. Pangani itself is about 5km away so if you are looking for a pub showing premier league football you have a good walk when the match is finished. Even ‘Shangri La’ could get boring after a while so if you are looking for a centre for a long stay, be ready for a quiet peaceful time. The food, although good, can get repetitive if your stay is longer than a few days. Don’t expect the white sands of Zanzibar. The sand is the usual light tan and does tend to hold in suspension in the water so, certainly near the shore, visibility under the water is poor. The water is clean though and there is no effluent discharge anywhere in the bay or around. If you are happy just to use swimming to ‘chill’ and don’t expect more then it is fine. The sand above the high water mark is very dark in a strip about 3 metres wide at the bottom of the path which means that return trips to your room really mean a foot bath. Apart from the usual problems that are an ever present in Tanzania of continuity of electricity, which can also lead to water pumping stations not operating as well, that’s it. Would I return? At the drop of a hat; but the length of my stay would depend upon the reason for me being here in the first place. As a centre to return to after a day’s teaching coupled with relaxing weekends, it is ideal. As a centre for a two week holiday without transport, it has its drawbacks. If you’ve googled this, I hope it has been useful.